Is anyone out in there re-enacting WW2 Soviet war correspondents? I like the idea of expanding to photographically cover both sides but would need help with research etc. before I would be confident doing so. Quite a fair amount of stuff you can work with to see how they worked - with a State run news/propaganda machine, there were many, many hands to make it work and plenty of evidence of their work remains. There is only one side of the People's truth, your NKVD handler will soon point this out with his Model 1895. Contact Comrade Frontovik, he has the necessary clearance to have a Camera within this Sector. Photographer is probably the easiest - you need a FED1. This website is a good resource - http://www.fedka.com. Mine is actually the first postwar model. In typical Soviet fashion they don't differentiate between minor variations but luckily Westerners have done that work and the FED1a to FED1d are pre-war and FED1e to FED1g are the postwar models. Avoid all other models of FED and Soviet cameras. Differences pre-war to postwar are the engraving on top, the shutter switch and the f-stops are the 'modern' ones plus some other minor details - e.g. the pre-war lens cap is metal the postwar one is bakelite (this has often been replaced by a metal one making the bakelite ones rarer and more sought after as it happens). On the plus side they can usually be had for about half the price of a pre-war one. 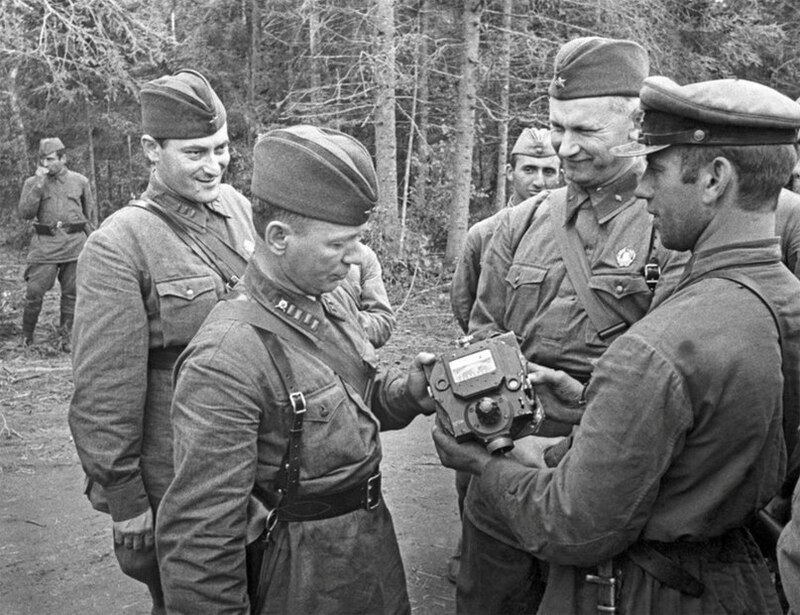 This is a good site listing some of the better known Soviet photographers http://nailyaalexandergallery.com/sovie ... rld-war-ii You'll, doubtless, recognise lots of the photos even though some of them are wildly mis-captioned on that site. There are some photographs of war correspondents with film cameras but, unfortunately, I know nothing about them so can't tell you what model etc. The best known non-photographer war correspondent is, of course, Vasily Grossman and a Google of "Soviet War Correspondent" basically returns a load of links about him. Though there is some stuff that is useful and I'd recommend a dig through that you don't get to see much of what equipment they may have used. I mentioned somewhere else on here I've only ever seen one Soviet typewriter and that was a beast of a machine for typing up ledgers. Finally I'm trying to find out what branch of service insignia they wore if anyone knows I'd appreciate it. I would imagine that they would fall under the Main Political Directorate. Propaganda = politics in Marxist Leninism. The Party controlled the Press, the Main Political Directorate was the mechanism for the goals of the Party to be communicated to/from the Armed Forces. I've just started re-reading Anthony Beviors (sp?) on Grossman and he has a quote from has boss/editor of red star who say 'he (Grossman) was constantly being mistaken for a medic because his insignia was the same green patches as the medical troops'. I can't really justify starting to collect another set of cameras so Contax will have to do. and a lot of these appear to pre-date the Soviet 're-distribution' of wealth (cameras) that occurred at the occupation of Germany. I looked through that thread and link. The choice seems to come down to a Leica II/III or a FED1 - In terms of looky-likey the Zorki1 is a straight copy of the Leica II. The FED1 had been in production since 1934 and total numbers were up to 180,000 by 1941. Anyone whose job needed a camera would likely have had one. Thanks for that anecdote about Grossmann though I tend to doubt Beevor. His research often doesn't bear a lot of scrutiny. I've asked the question where we're likely to get the correct answer so hope to hear back soon. Comrade Botty... you are about to aquire a complete new set of gear... the camera is amongst the cheapest part! Unless you intend to skimp on the rest... in which case copies of this thread will appear at your show trial! Tak tochno, the whole criminal case would be fully documented by yourself Comrade botty, saving many Roubles and man hours of KOMSTITCH in prosecuting the case, you may get a commenation from them. With this intended to be a secondary impression and to avoid economic strain to the five year plan a minimalist approach will have to be taken to the uniform and equipment scale of issue. Cap, tunic, trousers, belt and bread bag/rucksack as a camera bag is the intention. FED early Leica can be picked up for not too much so I will look into that again (but not an original FED1. Capitalist exploiters are selling this state property for £1500!). As a son of an oppressed worker in the pre-revolutionary state early malnutrition means I am small for my age. Boots will cause a problem. Hopefully the commissar will overlook my use of captured fascist items as these are the only ones I have found to fit. FED early Leica can be picked up for not too much so I will look into that again (but not an original FED1. Capitalist exploiters are selling this state property for £1500!). They're whistling in the wind. Look at the prices on fedka.com. Pricy enough I'll grant you but nowhere near that. German boots look silly in RKKA form, they fit wider to accommodate the less form fitting woollen trousers. They are also inferior in waterproofing and anti frost abilities, the hobnails allow cold up through them as well as water. What is your european size? I can almost guarantee you that i can find boots your size. Last edited by A-Babchenko on Thu Mar 21, 2013 19:57 pm, edited 1 time in total. Size UK 6 European 38.5-39? Were Soviet war correspondents armed? If comrade botty's wearing Wehrmacht Marschsteifelen he'll get short shrift. Well this picture of Sholokhov (who is badged up as a Rifles Polkovnik), Petrov and Fadeev shows a pistol and SVT bayonet. Though I do wonder how much of that is linked to their titular officer rank i.e. regulations say officers have to carry a sidearm.